Buying handlebars: What do I have to pay attention to? Handlebars are as diverse as the bikes are. 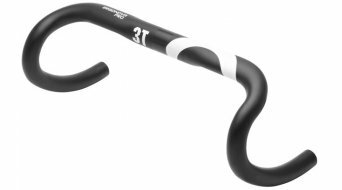 While a more or less straight handlebar is used for most of the bikes, road bikes feature a curved drop bar which is equipped for different handle positions. But what do I have to pay attention to when choosing the correct handlebar in order for the handlebar to fit my bike and, most of all, myself? How can I optimally adjust the handlebar to myself? First of all, you have to ascertain, in which stem to install the new handlebar. The stems are on principle different in length (measured from the middle of the handlebar clamp brackets to the middle of the steerer clamp) and in the clamping width of the clamping areas. Currently, the most common standard of MTB handlebar diameters is the measure of 31.8 mm, but there area still older, more narrow measures around, such as 25.4 mm (MTB and trekking bike) 25.8 mm and 26.0 mm (can only be found with road bikes). In the course of the last years, the measure of 35 mm was added, which offers special torsional stiffness. The larger the diameter, the higher the torsional stiffness! If you now know which measure you are looking for in a handlebar, you have to determine the shape and the width next. Here, your personal favourites and your riding style are essential. The wider the handlebar, the more riding stability you'll have at high speeds. But you'll have to move your arms and shoulders a lot more to get an appropriate turning angle, thus the agility is declining first of all. Therefore, an especially wide handlebar should best be mounted on a shorter stem in order to maintain the agility of the bike, to the extent that this fits the frame geometry, since not every steering angle fits every handlebar/stem combination. For instance, a cross country bike with an 800 mm handlebar and a 40 mm stem will certainly ride as badly as a downhill bike with a 600 mm handlebar on a 100 mm stem. If you are uncertain, just orient yourself towards the measures the manufacturer has chosen for the bike. They often fit well together and will give you an idea into which direction it might head should you wish a change. Often, the only answer is to test different handlebar shapes, widths and bars. We 'd love to advise you and to help you choose correctly! 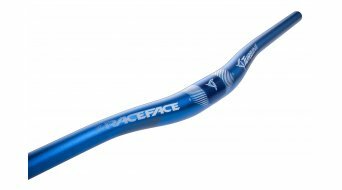 MTB handlebar: What are sweep and rise? When you look at mountain bike handlebars, you often come across the terms sweep and rise, which serve to adjust the handlebar to your personal preferences. The term sweep describes a bend and is differentiated by the terms rise and (back-)sweep meaning a bend upwards or to the back. Rise means the raising of the handlebar ends in comparison to the handlebar base. A higher rise results in a more upright, relaxed sitting posture, but also simultaneously less steering pressure on the front wheel, which can be compensated with an active riding style. The bend to the back, the back sweep is indicated in degrees and should adapt to the natural hand position. The deeper the angle, the less the wrists must be angled, a lower angle results in a more direct steering behaviour. The handlebar of the MTB is equipped with grips which are chosen dependent on the size. There are different materials that grips are made of, such as cork or foam rubber and for the stabilization of the wrists, they are available in an ergonomic shape. Barends are an addition to the handlebar. You either love the barends or you don't. At first glance, it is a lot easier for the road biker, since there is the thumb rule for the road biker that the handlebar should have "shoulder width" (meaning the distance between the shoulder joints), so that the arms are parallel to the handlebar. Whoever wishes to do something for the aerodynamics or the agility of his bike, will choose one size smaller. The size of road bike handlebars almost always refers to the space of the middle of the handlebar clamping in the area of the gear levers. You should also observe the socalled reach, which describes the protrusion of the handlebar from the base bar to the gear levers and the drop. The drop is the difference between the upper and lower bars. Road bikers most of the times prefer a longer reach and drop, but with the stem length and the number of spacers, this results in a lot of variants for configuring the sitting posture according to individual wishes. For handlebars, mainly carbon and aluminium are being used. A carbon handlebar saves weight and at the same time is stiffer, it also filters impacts better, but is susceptible to damages at falls. Aluminium is easier to handle, but not indestructible.